Update: The challenge has been won by the M.I.T team (see final map below). 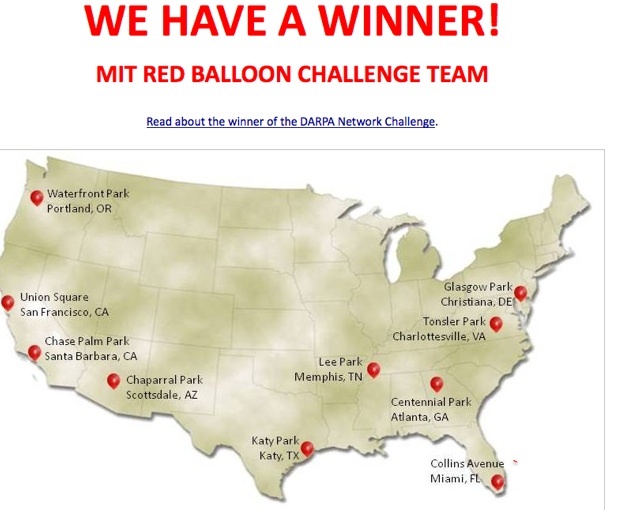 This morning DARPA launched ten red balloons across the U.S. in a Network Challenge to celebrate the 40th anniversary of the precursor to the Internet, Arpanet. 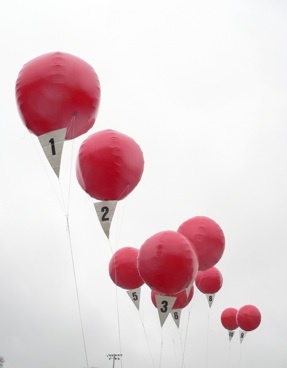 The first team to correctly locate all ten balloons will win a $40,000 prize. The idea is to see how people can self-organize on the Internet and how information disseminates through social and viral networks. There are thousands of people looking and teams set up on the Internet. They offer different incentives for participating. For instance, a group at M.I.T. is offering $2,000 for each correct balloon sighting submitted (you can join the TechCrunch team here). The 10 Red Balloons team claims to have already found pone balloon before the contest even started. And the Open Red Balloon Project is taking more of a, well, open approach. It wants everyone to report their sightings and guesses, make all of that data available to everyone, and then let the first person to make sense of the data win the entire $40,000. You drag ten balloons around on a map. Known locations turn red. 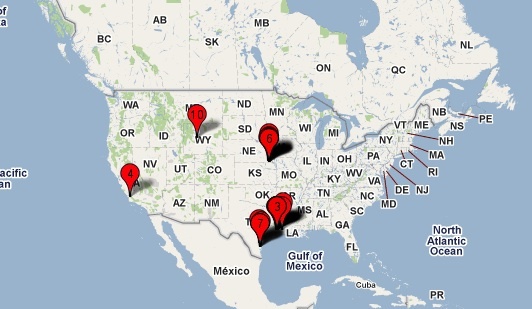 It already shows ten reported balloon locations on its map (whether those are correct or not, only DARPA knows). And there’s always Twitter. Just search for #redballoon or #redballoons. One’s supposedly been spotted near the public library in Brainerd, Minnesota. But beware of false reports! That is just another strategy to throw people off the scent.